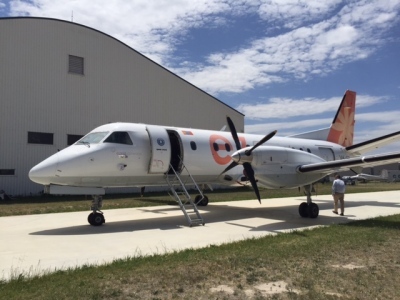 BANGOR, Maine – C&L Aerospace, a C&L Aviation Group company, has delivered a Saab 340B MSN 425 to Fly Corporate, based in Brisbane, where it will expand their passenger operations throughout Australia. The aircraft received air-worthiness checks at the C&L maintenance facility in Bangor, Maine before its departure. The transaction is the most recent deal in a relationship that spans the past 7 years. Fly Corporate is an Australian regional airline based at Brisbane Airport, Queensland. The airline operates scheduled regional passenger services in Queensland, New South Wales, and Victoria. Fly Corporate operates a fleet of Saab 340B Plus and Fairchild Metro 23 turboprop aircraft.